On 5th June 1994 pictures of commemorations for the D-Day landings were transmitted around the world. The British Royal Family and twelve other heads of state attended the event in Portsmouth. Some of the VIPs included Jim Bolger (New Zealand Prime Minister), Jean Chretien (Canadian Prime Minister), John Major (British Prime Minister), Lech Walesa (President of Poland), Grand Duke of Luxembourg, President Michael Kovak (Slovakia), Paul Keating (Australian Prime Minister), Gerasimus Aresnis (Greek Defence Minister), Prince Bernard of The Netherlands, King Albert of Belgium, President Bill Clinton, The Queen, The Duke of Edinburgh, President Francois Mitterand of France and King Harald of Norway. As can be seen from the above list of VIPs security around all the events was very high and preparation for the event took years to arrange. The Commemorations included a Drum Head Service and was then followed by a Fleet Review. The Ships included in the fleet review were Queen Elizabeth II, USS George Washington, Vistafjord, Jeremiah O'Brian, USS Guarn, Seabourn Pride, Silver Cloud, HMS Fearless, HMS Illustrious, Canberra, USTV State of Maine, RFA Sir Percivale, Kristina Regina, HMS Ursula, FS Loire, FS Croix du Sud, FS Clio, HMS Hurworth, HMS Sandown, HMS Spey, HMAV Ardennes, TS Royalist, Brocklebank, TS Navigator, ML 293, Emest Brown, Balmoral, Waverley, Destiny and Shieldhall. The Royal Yacht Britannia took a route out of the dockyard and around the fleet before heading for Normandy carrying the Queen and heads of state. As HMY Britannia sailed past the war memorial on Southsea Common there was a fly past of various RAF Planes and by Concorde. 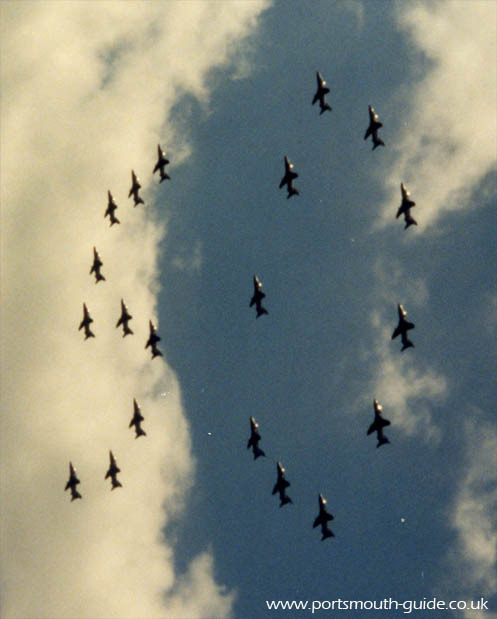 The above picture shows the formation of a '50' which some of the jets flew over in. The picture below shows HMY Britannia making her way along the lines of ships before embarking on her journey to Normandy. Adding to these events there were many others including a Mast Manning demonstration and a veterans march past. The picture below shows some of the veterans with their companies flags marching along Southsea sea front. The march past was a site to see. The Red Arrows made one of many appearances in Portsmouth to perform a display for spectators to see. The only down side to this magnificent occasion was the weather, true to 50 years earlier, it rained. People did not let this deter then from taking in the events with crowds of people attending all events. The events were to commemorate the D-Day landings, many boats for the landings had left from Portsmouth 50 years earlier on a journey to France, not knowing quite what was ahead of them. The event was aimed to let people remember what men had done to secure our freedom. Portsmouth is home to the D-Day museum which houses the Overload embroidery. The museum tells the events of D-Day in an embroidery, visual guide and vehicles from the time. 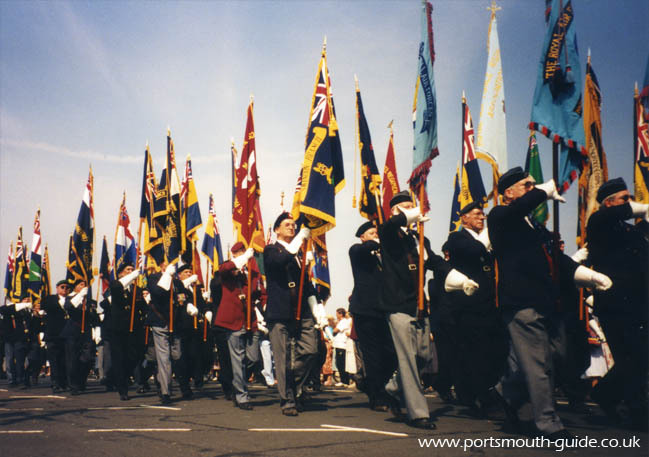 Portsmouth has also hosted VJ day, VE day and Forgotten Fleet commemorations on Southsea Common. As Britannia got out to sea a plane dropped poppies over the ships to commemorate all the men who gave their lives to secure our freedom. For details about Portsmouth's D-Day 65 events please click here.